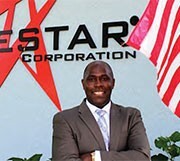 Greg Celestan stands in front of a building with the words Celestar Corporation on a wall behind him. When Greg Celestan, an intelligence officer with U.S. Central Command at MacDill Air Force Base, set out to create his own business at the end of his 20-year career, he turned to the Small Business Development Center at USF. It was good strategy, says the retired lieutenant colonel. Five years later, the knowledge management and defense consulting firm he started, Celestar Corporation, was named to Inc. Magazine’s “500 Fastest Growing Companies” roster. Today, the firm’s 120 employees serve clients worldwide and it recently hit a new milestone: $20 million in revenue.